My funny family clowning around at son’s 4th birthday party. Yours truly disguised as Buffy the Clown. Welcome to Friday Funnies. How about a little Giggle Getaway? I always wanted to be a clown, but everybody just laughed at me. So, I raised four clowns instead. They, in turned, passed those funny genes on to my grand clowns. So far, there are five funny grand bunnies. We never know what to expect. This video of grand baby’s lip smacking and funny faces always makes me laugh. I don’t know which is funnier, my daughter’s laughter or grand baby’s lip smacking and funny expressions. What do you think? 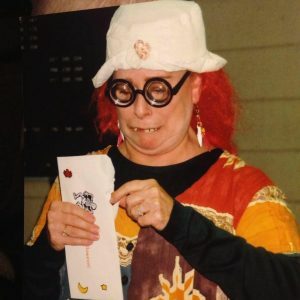 My mom clowning around a few years ago. I love being part of a funny, quirky family. 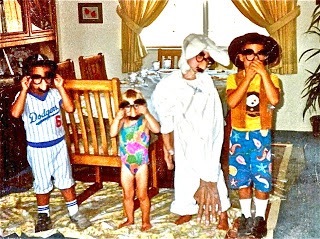 My son in a rabbit outfit with long arms and freaky big hands, two of my nephews, and middle daughter. 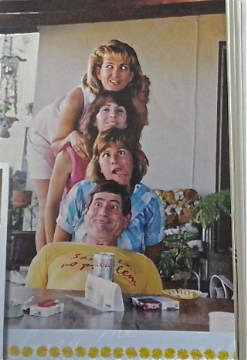 From the bottom upwards: Dad, my sister Pam, me, and my sister Cindy in the early ’80s. I hope some of these gave you a chuckle or two. If not, you can read this link about When Laughing Isn’t Appropriate. How about you, do you come from a funny family? Do you like clowns? What makes you laugh? I hope you have a wonderful weekend. Thanks for visiting. 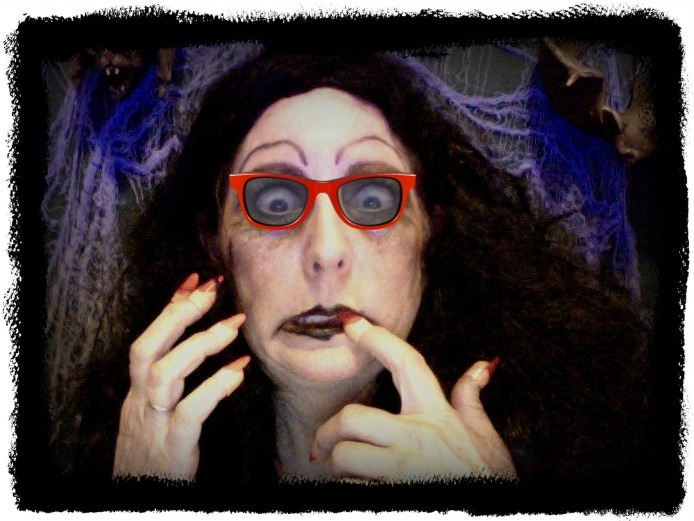 If you enjoyed this post, I’d be tickled if you’d subscribe! This entry was posted in family, Funny, Kids, YouTube Video and tagged baby's funny faces, clown, clown at birthday party, clowns, funny family, hilarious, lip smacking, rabbit costume. Bookmark the permalink. Our family didn’t have that kind of sense of humor. Glad yours could share in the zaniness. I’d say no worries! Alex. If you say no worries, then I’m A-Okay! Thanks so much for stopping by again. You rock. Have a wonderful weekend. I have no aversion to clowns. I think of myself as a clown but I’m sure not a lot of others would. I crack myself up mostly. I do love laughing though. And, I can laugh at myself if need arises. Well, of course I can, I’m pretty darned funny, just ask me. My family were not clowns but we did sometimes clown around. Usually just at home where no one saw us. And there’s no photographic evidence. Thanks for the snickers this Friday. Always good to enjoy a guffaw on occasion. Good to know you have no aversion to clowns, Patricia. I can vouch for your sense of humor. Some of your blog posts are pretty funny and mighty clever to boot. 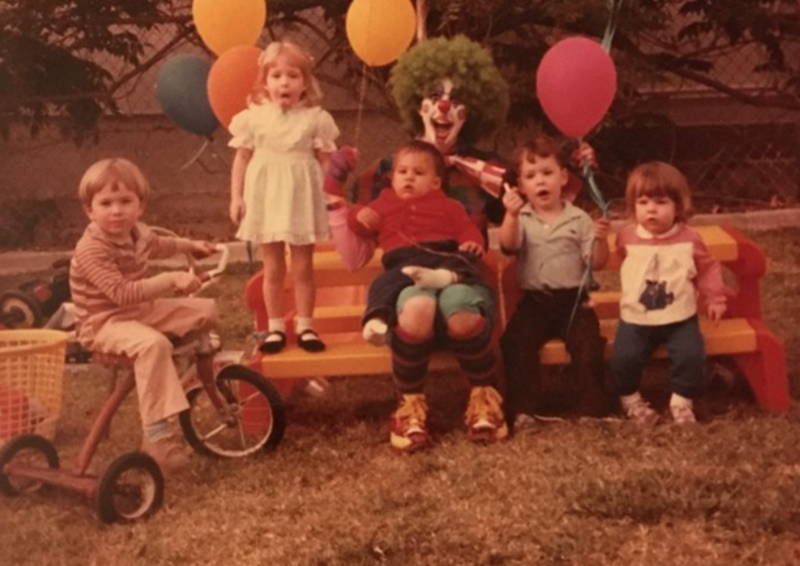 Good to know your family does clown around, even if there’s no hard evidence to prove it. I’m glad you got a kick out of my crazy family antics! Hope you have a great weekend! Thanks, Yvette! I grew up in a funny, quirky family. That’s a fun picture. Too bad my two brothers didn’t get in on the fun. I don’t think they were there that day. Thanks for visiting!